There are many ways to configure EMC2, suiting many different uses. But perhaps the most common is control of three stepper motors. This post describes the process I went through to configure EMC2 for my CNC machine, which is a Fireball CNC V90. These steps may not match exactly your needs, but perhaps it will help as a starting point for further exploration. It assumed that you have managed to get EMC2 installed and have run the latency tests with no overruns. If you are seeing overruns then try the hints on the EMC2 Troubleshooting page. When you see ‘$’ in this post, it represents the user prompt. Don’t type it, only type the commands that follow. Replace “andy” with your own user name. The test will output a set of numbers. Use the PC to browse the web, play music and check email for a few minutes. However don’t run EMC2. Stop the test and note the largest value in the “ovl max” column. In my case it was 92,191. Values over 100,000 may not give good performance. In general the larger the value the worst CNC performance will be. There are some hints in the EMC2 wiki on how to lower this value. 92,191 means 92.191us (us = microseconds). Between the PC at the stepper motor is a driver chip, such as the SLA7078MR. This chip has some delays that are required for each edge. By reading the datasheet for the driver chip we can find out what this is, and for the SLA7078MR it is 12us. If you don’t know or not sure, I would suggest you pick a value similar to this and err on the side of caution by making the value a bit larger. So we have 93us (rounded up) + 12us = 105us = 105,000ns (ns = nanoseconds). This is the BASE_PERIOD (more on that in a bit). Therefore the maximum step rate for my PC is 1 / (105us x 2) = 4,762 steps per second. It’s possible to tweak the steplen, stepspace, dirsetup and dirhold values to achieve better results than this, but that topic is outside the scope of this post. See the EMC2 documentation for details. We next need to calculate how many steps are needed to move one inch with 1/4 microstepping. If you wish to use a different microstepping configuration or millimeters then adjust the following calculations accordingly. My stepper motors require 200 pulses per revolution. This is a very common amount. With 1/4 microstepping it will take 200 x 4 = 800 steps per revolution. On the X and Y axis of my machine the lead screw has 10 turns per inch but it is has two starts, which makes it 5 turns per inch. This is a pitch of 1 / 5 = 0.2 inches. Therefore 0.20in / 800 steps per rev = 0.00025in per step. Therefore 1 / 0.00025in = 4000 steps per inch. 4000 becomes the INPUT_SCALE value for X and Y. The maximum speed is 4762 steps per second / 4000 = 1.1905in per second = 71.43in per minute. 1.1905 is the MAX_VELOCITY for X and Y. On the Z axis of my machine the lead screw has 12 turns per inch. This is a pitch of 0.0833in. Therefore 0.0833in / 800 steps per rev = 0.000104166in per step. Therefore 1 / 0.000104166in = 9600 steps per inch. 9600 becomes the INPUT_SCALE value for Z. The maximum speed is 4762 steps per second / 9600 = 0.4960416667in per second = 29.7625in per minute. 0.4960416667 is the MAX_VELOCITY for Z. We now have all the information needed to complete the configuration of EMC2. First we must copy the example configuration files and then customize them. Scroll down to the BASE_PERIOD line and set it to the value calculated in nanoseconds. In my case it is 105000. Scroll down to the trajectory planner and set the MAX_VELOCITY value to the largest MAX_VELOCITY value of all the axis. In my example it is 1.1905. Scroll down to the section that configures the first axis (X) and set the INPUT_SCALE to the value calculated. In my example it is 4000. Set the MAX_VELOCITY and STEPGEN_MAXVEL to the MAX_VELOCITY value for the axis. In this example it is 1.1905. Repeat for the Y and then Z axis. Simply change the “03”, “02”, etc. values to match the pin numbers used by your board. 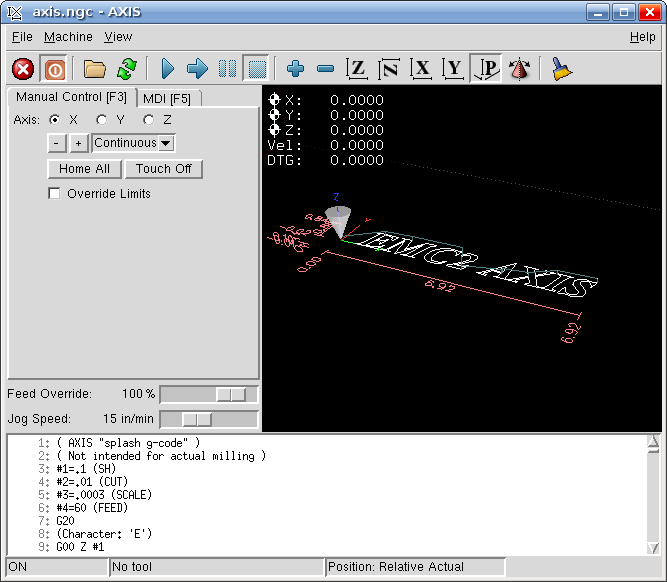 “Xstep” means the step input for the X axis. Edit mymachine_inch.ini and set the new BASE_PERIOD value. Note that this will lower the speed of all axis. 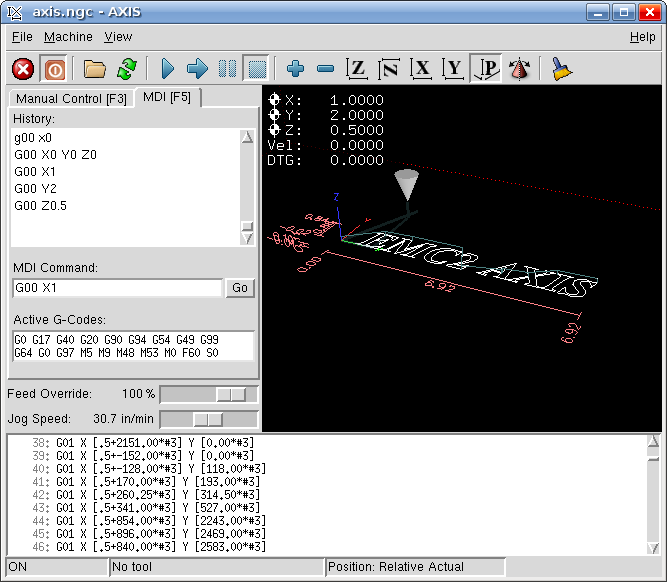 Recalculate the MAX_VELOCITY value for all axis and update the configuration file with the new values. Then retest. I found that on my PC it can operate at the theoretical maximum speed without problems. I hope this helps you configure EMC2 for your machine. This post describes the first steps after running EMC2 with the AXIS interface for the first time. 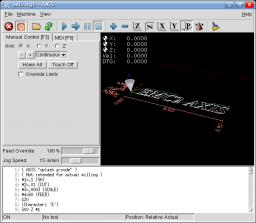 To start choose AXIS -> Sim from the menu after starting EMC2. 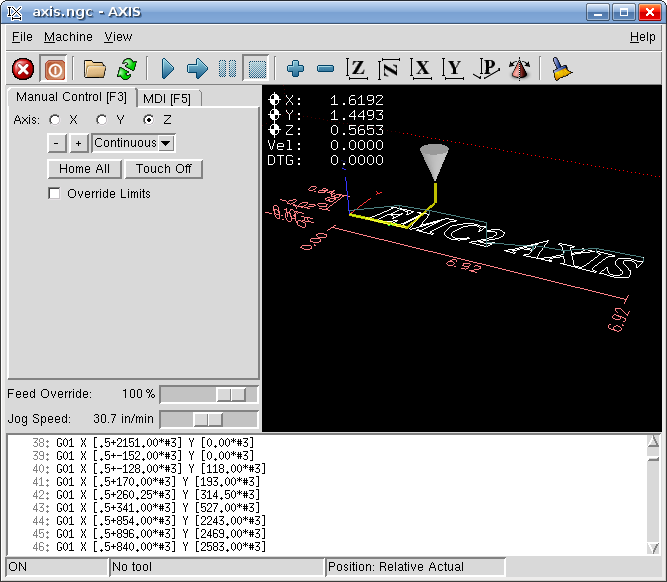 Starting the attached CNC machine (in this case a simulation) requires two steps. First the emergency stop (e-stop) must be turned off. Then power must be turned on. To turn off the e-stop click on the toolbar button that looks like a red circle with an “X” in it. To turn on the machine click on the toolbar power button (to the right of the e-stop button). At this point most of the user interface should now be enabled. Until you have a real e-stop button connected to your machine, you can click on the toolbar E-stop button at any time to stop the machine. Drag the “Jog Speed” slider to something like 30 in/min. Now to jog the axis. Make sure the “Manual” tab is selected. The display also shows the current X, Y and Z position in inches of the tip of the cone, which represents the tool (drill bit). Now try clicking on the execution toolbar button, represented by a blue triangle. 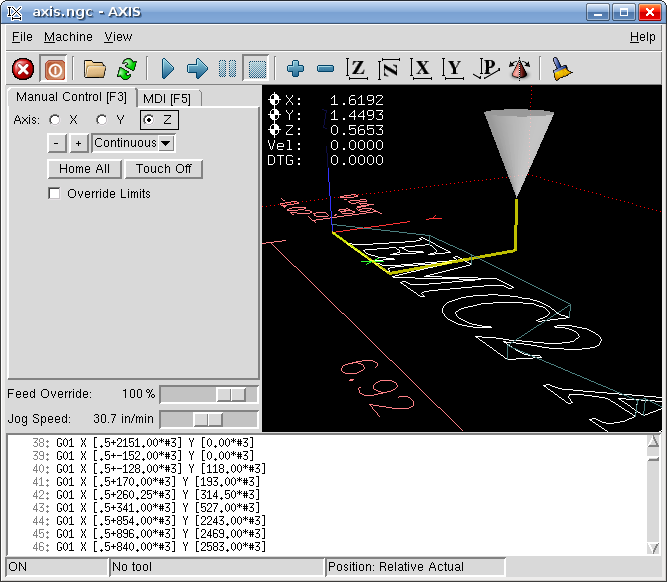 EMC2 will execute the loaded g-code file, which outlines some text. Watch the cone move as the code is executed. There are additional toolbar buttons to pause, step through and stop execution. To zoom in on the display move the mouse over the display and use the scroll wheel on your mouse. Alternatively press the right mouse button and drag. To pan the display move the mouse over the display, press the left mouse button and drag. To rotate the display move the mouse over the display, press the scroll wheel and drag. There are also toolbar buttons to control this operation. In addition there is a toolbar button representing a broom. Clicking on this will clear the lines showing the path that the tool has made. G00 means move the tool as quickly as possible. This is only used when not cutting, as it is typically too fast to move the bit through a material. 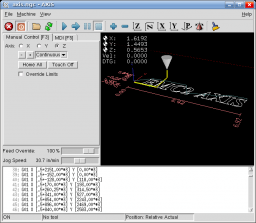 Note that all the numbers used in this tutorial are in inches, however it is easily possible to configure EMC2 and AXIS to use millimeters. In which case G00 X1 would move along the X axis one millimeter.